Hugo & Victor move to Miami. The young Parisian house of pastries and chocolates is opening its first international address in Miami. Hugo & Victor, aka Hugues Pouget and Sylvain Blanc, are opening their first address outside of France and it is in Miami that they have decided to put forward their delectable creations. Located in a typical Art Deco building, The Webster has become one of the trendiest fashion temples in the United States, bringing both a luxurious and edgy selection of big names and designers. And the creative French creative duo will not only be exporting pastries and recipes, but will continue work as they do in Paris, by following the seasons, and using only the best local produce. 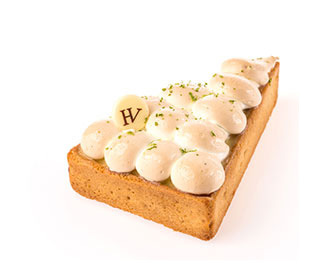 As illustrated by their key lime pie, a famous Floridian pie that they have reinvented, and their Carnet des écrivains, proposed in an exclusive citrus edition. ...and Hong Kong its 85th year. Join Eric Briffard at the market. A new restaurant at the Peninsula Tokyo. Download a newsstand on your iPad with AF Press.